Narrowing of the spinal canal due to genetics (congenital stensosis) or from osteophytes and disk herniations (degenerative stenosis). Degenerative stenosis is much more common that congenital stenosis. Pathophysiology: As the intervertebral disc ages with time, there is degeneration of the dis due to decreased water content within the disc. As a result, the disc becomes less gelatinous and more brittle. The disc loses height and its contents can form a disc bulge or herniation. As a result of the degeneration, osteophytes (bone spurs) form that will decrease the space allowed for nerve roots (this is called stenosis). As the space decreases, nerves are compressed which can cause nerve and back pain. Spinal stenosis is most common in the lumbar (lumbar stenosis) and cervical spine (cervical stenosis). Symptoms will vary according to which level of the spine affected as well as the anatomic location of stenosis. Spinal stenosis can affect the nerve roots as they travel in the lateral recess (the edge of the spinal canal) or the foramen (the exiting passage of the spinal canal). Pain when standing/ walking that is relieved by sitting (neurogenic claudication). Typically people can only walk a short distance before they have to sit down. In addition, paitents often have to lean forward when walking as an attempt to open the spinal canal. – Decreased coordination or weakness of hands (especially hand grip strength), numbness/tingling of arms and hands, loss of balance, change in gait pattern, change in bladder/bowel habits. These symptoms are called.cervical myelopathy and require an urgent evaluation by the surgeon. A physical examination plus MRI examination of the affected part of the spine is necessary to visualize stenosis. CT myelogram will suffice for those unable to undergo an MRI. X-rays also help in looking at overall spine bony alignment. Occasionally, a nerve conduction study (NCS/ EMG) can help with assessing whether pain stems from the spinal cord or a peripheral nerve. Non-operative: Medications (preferably anti-inflammatory medications) can help control pain,. Physical therapy can help strengthen musculature surrounding spine for stability. Epidural steroid injections can help decrease inflammatory response and decrease pain. Operative: Surgical treatment of stenosis requires decompression of the nerve(s) or root(s) affected. This can be done by laminectomy (traditional method) or laminotomy/ foraminotomy (minimally invasive technique) depending on the area of stenosis. If instability of the spine is noted (spondylolisthesis) or if stenosis is so severe that the facets need to be removed, then a fusion procedure may be required as well. Laminotomy/ foraminotomy is a minimally invasive technique removing the minimal amount of bone for visualization to ensure safe decompression of the nerve and removal of offending structures. This is opposed to a laminectomy which removes the entire back of the vertebra and posterior ligaments. SPORT Trial: Surgical treatment of lumbar spinal stenosis led to significant improvement in all outcome measurements, including pain and functional outcome scores. Weintsein JN et al. Surgical compared with nonoperative treatment for lumbar spinal stenosis. New England Journal of Medicine 2008; 358(8): 794-810. 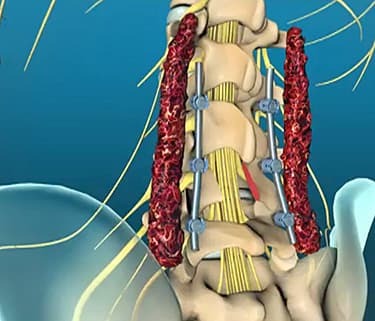 Laminectomy is a commonly performed procedure to treat spinal stenosis. The procedure involves resectionof the spinous process, lamina, and mesial (most midline portion) facet joints. In addition, foraminotomy is also performed. If required, a diskectomy can be simultaneously done to treat a disk herniation. Laminectomy can also be done when spine tumors need to be removed. Although an excellent procedure to treatment of certain disorders, Laminectomy does carry the risk of facet injury and spinal instability.